Swedish pre-fabricated data center specialist Flexenclosure has received an order to install two of its eCentres in Vanuatu and the Solomon Islands, where they will be used as submarine cable landing stations. The two 21 square meter (226 sq ft) modules were commissioned by Vanuatu-based telecommunications consortium Interchange to land ICN2, a submarine cable system joining the two islands. In 2014, the group completed ICN1, connecting Vanuatu to the Southern Cross submarine system linking Australia and the US. The latest modules will be located in Luganville, Vanuatu's second biggest city, and in the capital of Solomon Island, Honiara. Flexenclosure designs and installs pre-fabricated data center and telecommunications modules. The company has two production facilities in Sweden, where it is based. As well as eCentres – which are either purposed as cable landing stations or as edge data centers, the company builds hybrid power systems for telecom sites. Since 2016, it has shipped eCentres to three Pacific Islands: Samoa, Palau, and Fiji. 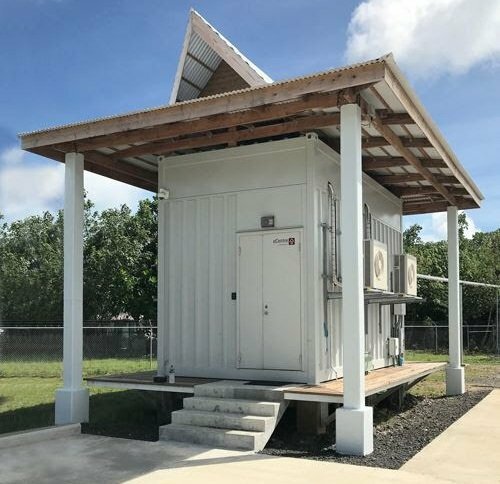 CEO David King said the modules were “ideal” cable landing stations, as the ruggedized structures can withstand harsh environmental conditions and be delivered anywhere. Though most of its orders come from developing countries - just this year, it has sold or installed modules in Nicaragua, Honduras, Ecuador and the Philippines - the company most recently agreed to supply an eCentre to an undisclosed data center provider in Australia, six months after a 20-module order from local ISP Virtutel.